Jordan here, and I've emerged from the world of coding websites to take over the blog. Momentarily. To announce that the newest version of our website will be launching tonight. We're really excited to share it with you. When we started working on Raelene's designs almost 8 years ago now, I had enough coding knowledge to make my text change colors on the occasional eBay listing. Awesome, right? Well, it didn't take long for that knowledge to be inadequate, and after several less than successful evenings at our local Farmers' Market, I bought a book on HTML coding and started teaching myself to build websites. 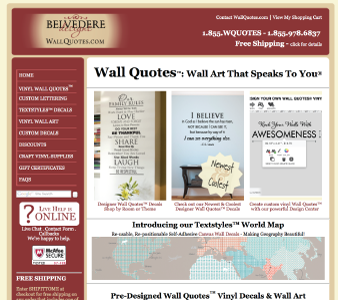 The creation of our first site - wallquotes.com 1.0 as we like to call it - was a tremendous learning experience. During the 6 months that it took me to move from concept to launch we had our first child, I completed most of the first year of my PhD program, and we played a lot of Scrabble at lunch - we love words. Most people ask us how we managed it all, but having a baby that wakes up every couple of hours helped keep us going, 'round the clock - ha! When I built this site over 6 years ago - it first went live December 2007 - I was super proud of the color changing menu buttons, and that it worked. 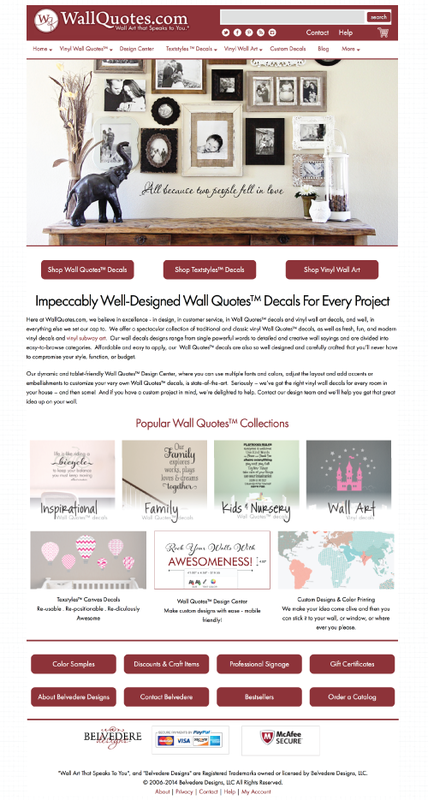 Raelene's craft ideas featured heavily in this first web effort, and after playing with the site for about a year I felt much more confident in building a bigger and better wallquotes.com. Well, at least a little part of it. I built a really, really big homepage when we first launched this version, and we phased out most of the craft inspired ideas so that we could focus on Raelene's text-based designs. Decals were really taking off and we are really proud of the impact that this version of the site had on the market in general - if you're nerdy enough to check out google labs for the development of the Wall Quotes™ decals brand name, you'll see that our "wall quotes" as a search term really took off shortly after this new launch. 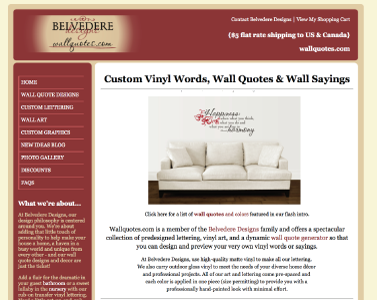 When we launched this version - June 2009 - Belvedere Designs was still just me and Raelene, working long, long hours to make it all work. I took a year off of school and we sold all of our furniture to make room for production in our little 600 square foot house in California, but it all started coming together and we kept growing. Even looking back at this picture now I smile as I think of our son playing with the boxes before shipping and how happy we were when we'd be sitting out in the backyard having lunch and we'd hear the email notification of an order coming in - great times. So that many updates are probably an exaggeration, but not by much. Over the years I've lost track of how many times I have updated this site to make it reflect our new ideas and to try and keep it fresh. And how many times it broke when I tried to talk Raelene or some other unfortunate soul into helping me finish the more tedious programming goals. The site has been very good to us as we've grown from just us to our current size of 10 employees, but about a year and half ago we knew it was time for an upgrade. The capabilities of website coding have grown exponentially since I first built the site and we wanted to make sure our new site reflected that. It took me a couple months of tinkering with the existing site to determine that even an extensive remodel was not going to work - we needed to start from the ground up. So a year ago we started building the new website, and what feels like the entire company, from scratch. For the first time too we hired a dedicated web developer to help us grow (Thanks Bruce - you're a gem!) and after a year of building and tweaking and polishing we are finally here at the great reveal. Awesome, right?! In addition to looking awesome here, it'll look and work awesome on your phone or tablet too. We've added a ton of new features, and we have a lot of new and never before seen Wall Quotes™ decals and wall art up already. We'll have new video content and images as well. I'm a bit of a perfectionist. Ok, I'm a lot of perfectionist, so we'll be making changes over the next couple weeks to fine tune the site, but we're really excited that you'll get to use it now. We're immensely grateful for how much we've grown over the years and your contribution to our success story - whether it is proudly displaying your Wall Quotes™ decal, or telling your friends about us, or sharing a picture on Facebook or Pinterest - it means the world to us. So enjoy, and do let us know what you think of our new site. 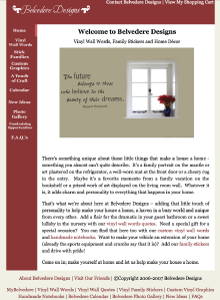 And I'll give the blog back to our wonderful design team now. Thanks!